Given by the President/Supreme Commander of the Armed Forces of the Republic of Indonesia. Commander-in-Chief of the Supreme Command for the Liberation of West Irian at a mass meeting in Jogjakarta, on 19th December 1961.
then in fact we did not suffer, merely two military actions from the Dutch, the first on 21st July 1947, the second on 19th December 1948, No. In reality the Dutch, Dutch imperialism, on hundreds of occasions has taken military action against the Indonesian People. Defence Council was most appropriate : that the Command I shall give … God willing – should not be given anywhere else other than in Jogjakarta, the centre of resistance against Dutch imperialism. Yes, on 17th August 1945 we proclaimed Indonesia’s Independence, we set up the Republic o£ Indonesia, which now stands firmly established, although several times struck by the Dutch, stands firmly established and today with a resolute mind even wants to bring the region of West Irian also into the territory under our authority. But, you know the Proclamation of 17th August 1945 was only one of the peaks of the Indonesian Nation’s efforts to set up their own state. You know that decades earlier the Indonesian people had arisen, arisen to become a free Nation, although they had been colonised for hundreds of years, although they had been trampled upon for hundreds of years, although they had been starved for hundreds of years, although they had been humiliated for hundreds of years, although for hundreds of years they had been made into a people of miseries, although efforts had been made to extinguish the National spirit entirely, yet – as I have said repeatedly – we arose again. I once said, even a worm will wriggle and turn when we tread on it, let alone men, let alone nations. The Indonesian Nation turned, set up organisations called the National Movement, which movement spread out, went deeper, spread out, went deeper, spread out, went deeper, eventually covering the whole of Indonesia. Spread out, went deeper, spread out, went deeper, ultimately on 17th August 1945 exploding as the first Indonesian Revolution. And it was at that moment, Friends, that the Republic of Indonesia was set up, that the Republic of Indonesia unfurled the Indonesian flag. White Flag is already known by all the people in this world, and as I have said, the greater part of mankind respects the Honoured Red and White Flag. Only the imperialists and the stooges of the imperialists do not respect the Red and White Flag. And as I say, God willing, the time will come when all the people in this world will respect the Red and While Flag wherever it may fly. As you already know, we have existed as an independent state since 17th August 1945. Now it is 1961. It has existed for 16 years already and we are indeed resolved that Indonesia’s independence will last not only 16 years – our pledge since 17th August, 1945 has been: Once free, for ever free, to the end of time. Chiefs of Staff, in short the entire Indonesian people, want to put into practice what is commanded by President Sukarno so that West Irian will speedily enter the territory under the authority of the Republic. Our struggle is not yet finished. Indeed, right here in Jogjakarta, I once emphasised that the Indonesian revolution is not yet finished and that therefore it is our duty to march on until our revolution has been completed. Of course, Friends, the Dutch are always launching counter offensives. As I said just now, the large-scale offensive in the form of the first military action on 21st July, 1947, was later followed by the second miltary action’ on 19th December, 1948.
the fire’s heart of revolution, we who grew up in the cauldron of Tiandradimuka and of revolution, we have now become a strong nation. We are not a nation that received our independence as a gift, we are not a nation that pleaded for independence. No, we are a nation that has waged a life and death struggle for independence, we are a nation tempered to the utmost in the struggle to build up independence, and we have emerged from this tempering as a nation that is mighty and strong. And this. is why, Friends, as I said just now, we give thanks to the Almighty that fire rained upon us in this struggle of ours. 17th August 1945, was the beginning of the mightiness of this fire. Fire rained as heavily as possible upon us, there were battles in all regions throughout Indonesia with the result that today the whole of Indonesia is full of the graves of our youth and our fighters. Fire rained upon us on 21st July 1947, and fire rained upon us as from 19th December 1948. But, thanks to God Almighty, 19th December 1948, was the beginning of total guerilla warfare. The guerilla warfare we waged was carried out not only by our youth in the Armed Forces, not only by our youth in the State Police. No, the entire people took part in this total guerilla warfare and in the end, as you know, on 27th December 1949, Dutch imperialism bowed the knee and recognized the sovereignty of the Republic of Indonesia. This is the outcome of our struggle. that the Round Table Conference brought us recognition of sovereignty by the Dutch and then by the international world. Merauke. What is called Indonesia is what was formerly referred to as the Dutch East Indies. What is meant by Indonesia is what the Dutch called Nederlands Indië, that entire archipelago between Sabang and Merauke which is composed of thousands of islands. And, at the Round Table Conference, the Dutch undertook to recognise sovereignty, independence, over the whole of that Indonesia, ‘Irrevocable” and “unconditional”. But what happened, Friends ? Even though the promise was made at the Round Table Conference that the question of West Irian would be settled within a period of one year, the one year passed and West Irian had still not been returned to us. This was a huge lie, a great deception which was played by the Dutch. In fact. we should have understood beforehand that imperialism is always lying, always dishonest, always playing tricks. Where was Diponegoro arrested years ago ? In Magelang, 46 kilometres from here. How was it that the Dutch could arrest Diponegoro ? They lied to him first, they deceived him first : they said they were inviting him to hold talks, to negotiate. But it appeared it was not to hold talks, not to negotiate, but to be arrested. The greatest possible lies, tricks, dishonesty. And we too have experienced the same thing, once more at the end of 1950. On 27th December 1949, they recognised Indonesian; sovereignty. On 27th December, 1950, West Irian had not been returned to us. It was at that time, I proposed to the Government of the Republic of Indonesia to dissolve the Indonesia-Dutch Union. Since we had agreed at the Round Table Conference to the establishment of the Indonesia-Dutch Union – an association between Indonesia and the Netherlands – the Republic that was recognised there was called the Republic of the United States of Indonesia, and the Netherlands placed in Djakarta not an ambassador but a High Commissioner of the Kingdom of the Netherlands. But we, who had for this reason agreed to the establishment of: the Indonesia-Dutch Union, we were tricked, we were deceived, we were lied to. And that is why we later abrogated, dissolved this nonsense of the Indonesia-Dutch Union. lasting for a whole year – from 27th December, 1949, till 27th December, 1950 – West Irian was still not included in the territory under our authority. And so from then on, we tried, we strove, we tried, we strove, to bring West Irian into the territory under the authority of the Republic, by means of diplomacy, through talks, through nice-sounding speeches at the United Nations. At the United Nations, we tried, we tried, until we pleaded, to bring West Irian into the territory under our authority. But what was the result? In the United Nations too, there was no result at all. In fact, in the United Nations there were those who said: we agree with the Dutch controlling West Irian. The Dutch said: oh, in West Irian, we are not carrying out colonisation, we are there, oh yes, only to educate the people of West Irian; we are not carrying out colonisation. And fancy, there are United Nations members who confirm this. “Yes, the Dutch are not carrying out colonisation. It is only Indonesia that says that the Dutch are carrying out colonisation”. Our struggle for West Irian, our verbal struggle, our fencing with words, our pleading in the United Nations did not succeed. Indeed, for a long time I have said: What is this United Nations? The United Nations is simply an association of human beings. Yes, they are people, representatives all of them representing this state, that state, this state, that state, this state, that state. that state, that state, representatives. But only some of those United Nations members, meaning only some of those representatives, are real fighters, real representatives of the common people of their states. They are just diplomats, who have suddenly been struck by good luck, who have had a sudden stroke of fortune, become the representatives of their country in the United Nations. When a session is on, they dress themselves up, doll themselves up in smart ties, and say: Yes, I am the representative of my people. They make fine-sounding speeches, and yet for the greater part, these speeches do not conform with the sentiments of the people they represent. “Here am I – here is Indonesia. Where are you?” Confrontation. Confrontation of what? They confront us economically, we confront them economically. Confront us politically, we confront them politically. They confront us militarily, we confront them militarily too. Yes, and that is why, ever since that time, we have been building up, strengthening our Armed Forces. And today, I am proud. There stand at attention before me, for all o£ you to see, new officers just graduated from the Military Academy in Magelang. Look at how smart they are standing there. They bear a great responsibility, to guard our independence, to guard our state, to defend our independence, and also, to bring West Irian into the territory under the authority of the Republic. You young men, graduates of the National Military Academy, standing now before me! I hereby officially invest you as officers of our Armed Forces. You must know, young officers, that your duties from this moment on are heavier than ever before. You are now leaders in the Armed Forces of the Republic of Indonesia. And today, the Armed Forces of the Republic of Indonesia have received my order to get themselves ready so that at any moment I give the order they enter West Irian to liberate it. And so you, too, young graduates of the National Military Academy, be at the ready, because, as I said just now, I have already given the order to the entire Armed Forces of the Republic of Indonesia, the Army, and the Air Force, and also the Navy, to get themselves ready so that at any moment I give you the command, you liberate West Irian from the strangle-hold of Dutch imperialism. As I said just now, I hereby invest you all as officers in the Army of the Republic of Indonesia. even crazier than before. As you know, Luns made a move, made a move in the United Nations. As I said just now, it is even crazier. Even more chaotic, even greater trickery against the Republic and the international world than before. At first, he made a move that sounded most pleasing to the ears, very attractive indeed. That is, he said: Nowadays, the Dutch don’t want to be bothered any more with West Irian, and so West Irian is going to be internationalised. At first, he said that he didn’t want to be bothered any more, or that the Dutch didn’t want to be bothered any more with West Irian, and so West Irian would be internationalised. And he said that he would make the move of decolonisation of West Irian. Decolonisation means putting an end to, putting a stop to the colonisation of West Irian. Later. on, he said he would give the people of West Irian the right of self-determination. This all sounds extremely attractive. Internationalisation, decoIo nisation, self-determination. But we, the Indonesian nation cannot be deceived, we, the Indonesian nation cannot be chained up, we cannot be caught in a trap. And as for that decolonisation! Now, they are talking about decolonisation, but before they said that they were not colonising. And, according to some countries, it is even true that the Dutch are not colonising. But now, in fact, they admit that they have been colonising because now they talk about decolonisation. Decolonisation means putting an end to colonisation. it mean? Setting up member states. We know the self-determination policy of Van Mook. But as a result of Van Mook’s policy, the Pasundan state came into existence, the state of East Java, the State of East Sumatra, the state of East Indonesia, and others. We were split up, torn asunder by imperialism, by this so-called “self-determination”. And that is why, Friends, when I first heard in Tokyo that the Dutch were going to pursue a policy of self-determination, I turned it down firmly. And I said that we are not prepared to accept self determination for West Irian from the Dutch. Friends, when Foreign Minister Subandrio met me in Rome on his way to the United Nations to deal with Luns, I reminded him of my previous order, namely, not to take up the West Irian question in the UN, but to pursue a policy of confrontation. But what could we do? Luns took the West Irian question to the UN, and we were therefore compelled to deal with it. And so, in view of this, we took a decision. Subandrio went to New York to deal with Luns. I was ill at the time in Rome. Dr. Subandrio came to Rome to ask for my instructions. And I told him: Your duty in New York is just one. One, not two, not three, but one, and that is, to defeat Luns’ proposal. Defeat the proposals of the Dutch so that the Luns proposal can not be accepted by the UN. My instruction to Dr. Subandrio was positive and clear, and he carried out my instruction in the best possible way. This is the proper place for me to compliment Dr. Subandrio, Foreign Minister Subandrio, for having striven so well to defeat the Luns proposal. Friends, after the Luns proposal had been defeated – and you know all about his defeat – these Dutch did not become wiser. They did not then say: Yes, I understand, so West Irian has to be returned to the Republic of Indonesia. No. They became madder than ever. What are they doing? They are proclaiming a puppet state called “the state of Papua”. They are flying a Papua flag there, introducing there a so-called “national anthem”, a “Papua national anthem”. This is another great wickedness. They were defeated in the UN, and now they go on with their trickery against the Indonesian nation. Establishing a puppet “state of Papua”, flying a “Papua flag”. We are one nation, Pa’Dimara said last night. 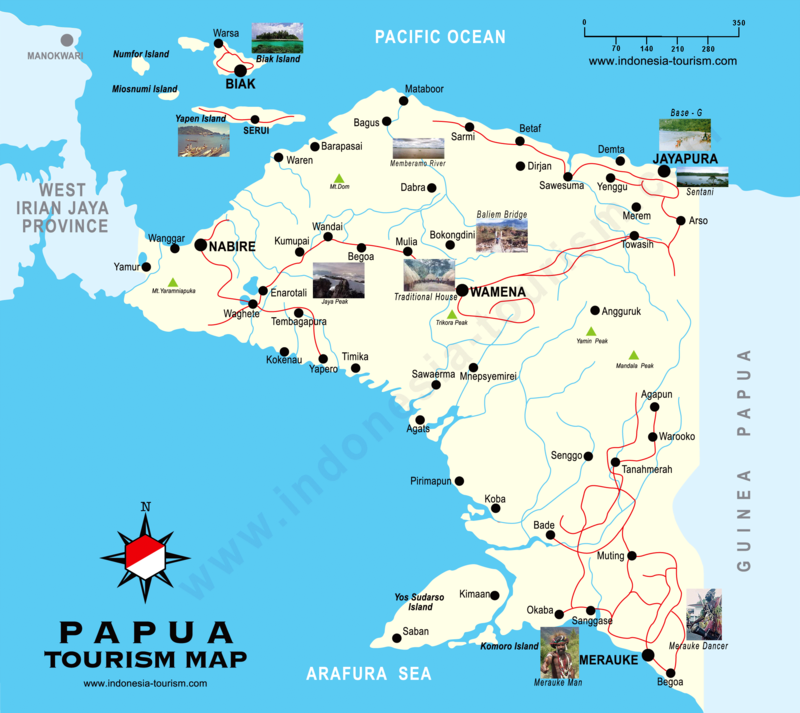 We know only one state in the territory of Indonesia and that is the State of the Republic of Indonesia. We know only one flag in this territory of the Republic, the Honoured Red and White Flag. We know only one national anthem in this territory of the Republic, the “Indonesia Raya”. And now, Friends, I ask you, I ask the international world, and I ask you ambassadors who are present here: “At this present moment, the Dutch are setting up a puppet state in West Irian, partitioning it from the Republic of Indonesia. A puppet state of Papua. In West Irian they are carrying out a policy of partition with the act of establishing a “state of Papua”, flying the “Papua flag”, introducing a so-called “Papua national anthem”. And what should we do? What should I do? What should the Republic of Indonesia do? What is to be done? Oh, yes, in the UN we can execute diplomacy, in the UN we can fence with words, we can use this argument and that argument in the UN, this reason and that reason. In the UN, we can table this motion and that motion, this resolution and that resolution. In the UN it is already clear there are no results. But now at present in West Irian, the Dutch set up a “state of Papua”, they fly the “flag of that state of Papua”, they create a “Papua anthem”. What must we here do? There is nothing else to do, we here must act. Act. And that is why I now give a command to the entire Indonesian people. And what is my command? Listen! My Command positively and clearly is: Frustrate, come now, all you people of Indonesia, defeat the setting up of that “state of Papua”! What is my further Command? Come now, all you people of Indonesia, unfurl the Honoured Red White Flag in West Irian! I give this command positively and clearly. Defeat this “state of Papua”! Unfurl the Red and White Flag in West Irian! Defeat it! Unfurl our flag! Be prepared, general mobilisation is coming! sentatives of states in the UN who have helped us, both from Asia, from Africa and from the Socialist states, Yes from the Socialist states, too. I thank them very much for their help in our struggle to bring West Irian into the territory under the authority of the Republic. Friends, some people accuse us: Yes, the Republic of Indonesia turns too sweet a face to the Socialist states, oh, the Republic of Indonesia is far too friendly with the Socialist states. I ask: and is this not fitting? The Socialist states have helped us, the Socialist states endorse our claim to West Irian. I said this before the women at the Gerwani Congress. Those over there, the imperialists, in fact they trip us up in establishing a strong unitary state of the Republic of Indonesia, they carry out subversive actions to destroy the Republic of Indonesia. These people endorse us in claiming West Irian so that West Irian comes within the territory under the authority of the Republic. Those people do not endorse us in demanding that West Irian comes within the territory under the authority of the Republic. These people help us to bring West Irian into the territory under the authority of the Republic. Those over there oppose us in bringing West Irian into the territory under the authority of the Republic. march onwards. As I have said, repeatedly, in fact we do not stand alone. Come on, defeat the “state of Papua”! Come on, unfurl the Honoured Red and White Flag in West Irian! Come on, every one of you, people of Indonesia! We do not stand alone! Look, it is not only 92 million people who want to do this but, as I have said repeatedly, other states, other peoples, in Asia, Africa, in the Socialist states, all of them are helping us. We do not stand alone. More than 2,000 million people are on our side. And so, let us march onward! And, friends, in fact, it is not just me who is speaking. No! Some people from the imperialist side say: Oh, that West Irian, that’s only Sukarno. Its only Sukarno who makes all that fuss. If there were no Sukarno, the West Irian fire would have gone out already. And, when I was ill in Vienna, some people said; Oh, let’s hope Sukarno dies. They prayed that I would die soon or were already speculating, oh now Sukarno is going to die. Briefly, oh there won’t be any more West Irian actions, And we imperialists will be able to enjoy ourselves again. I ask you, the Indonesian people, is it true that it is me, Sukarno, who urges you on to bring West Irian into the territoy [sic] under the authority of the Republic? No! No! No! I am but the mouthpiece of the people of Indonesia. I see young officers here before me. I see khaki uniforms over there. Behind me sit Ministers, leaders of political parties, religious leaders, representatives of the youth; representatives of the women. In front of me are the common people, the common people of all groups. Workers, peasants, women, men, youth, all groups of the people of Indonesia confirm what I am saying. I am not just giving expression to my own desire alone; every word I utter has the full support of the entire Indonesian people. And when I give the Command, in fact it is not Sukarno’s Command to the Indonesian people, in fact it is not the Command of the President of the Republic of Indonesia to the Indonesian people, in fact it is not the Command of the Supreme Commander of the Armed Forces of the Republic of Indonesia. it is not the Command to the Indonesian people of the Commander in chief for the Liberation of West Irian. I am merely continuing in the spirit in the hearts of the people of Indonesia. The spirit in the hearts of the Indonesian nation that loves independence. The spirit in the hearts of the Indonesian nation who always fight for independence. Together with you all, I, am merely continuing in the spirit of Sultan Agung Hanjokrokusumo, who tried to bring about the downfall of Jan Pieterszoon Coen’s power in the. territory of Indonesia’s native land. I am merely continuing in the spirit of Imam Bondjol. I am merely continuing in the spirit of Teuku Imam Tjik Ditiro. I am only continuing in the spirit of Djoko Untung Suropati. I am merely continuing in the spirit of Pangeran Diponegoro. I am only continuing in the spirit of Sultan Hasannudin. I am merely continuing in the spirit of Ktut Djelantik. I am only continuing in the spirit of our fighters in our Nationalist Movement. I am only continuing in the spirit of Monginsidi who was killed by machine-gun fire by the Dutch. I am continuing in the spirit of our fighters who now lie in the Semaki Hero’s Cemetery. I am continuing in the spirit of all the fighters of the Republic of Indonesia who now adorn the Hero’s Cemeteries all over Indonesia. I am only continuing in the spirit of the people of Indonesia who have loved independence from times of old. Yes, we love peace, but we love independence even more. And that is why, all you people of Indonesia, let us, as I said just now, defeat the attempts of the Dutch to set up a “state of Papua”, let us unfurl the Honoured Red and White Flag in West Irian. Prepare yourselves in a short time for the command to carry out the general mobilisation of the people of Indonesia in order to liberate West Irian completely from the strangle-hold of the Dutch imperialists. I ask the Secretary of the National Defence Council to bring the text of my Command here: I shall sign this Command in front of you all, may it be implemented, executed by the entire Indonesian people. The Secretary of the National Defence Council will read out the text of my Command. May God Almighty bless Indonesia’s struggle for independence. Great Leader of the Indonesian Revolution/ Commander in Chief of the Supreme Command for the Liberation of West Irian.